"Artifacts and monuments of the Ancient Civilizations proved that modern humans once walk on the surface of the Earth. Where are they now? Theorists say these advance human beings ascended into a higher state of consciousness that the humans now can't access. Channelers like me was told by highly evolve beings that these modern humans are now dwelling the Middle or the Inner Earth. Until now, the theory that our planet is hollow remains a mystery, but the fact is, even the idea that our planet is solid remains a theory, unless we humans could see the inner part of our beloved Mother Earth." In 1823, Captain John Cleve Symmes, a dour, humorless, retired war hero, petitioned the U. S. Congress for funds to conduct an expedition to explore the hollow earth. Captain Symmes and his small band of followers felt somewhat anointed for the task because the great American clergyman Cotton Mather had defended the theory of a hollow earth in his book The Christian Philosopher. Mather, in turn, had developed his hypothesis from a little-known essay penned by English astronomer Edmund Halley in 1692. The Lines were first spotted when commercial airlines began flying across the Peruvian desert in the 1920's. Passengers reported seeing 'primitive landing strips' on the ground below. No one knew who had built them or indeed why. 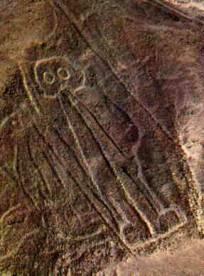 Since their discovery, the Nasca Lines have inspired fantastic explanations. There are also a few anthropomorthic figures situated on the slopes, the most famous being the 32 metre Astronaut (left) and E.T, discovered by Eduardo Herran in 1982 (E.T relevant : Unknown hieroglyphs). They are located in the Pampa region of Peru. The desolate plain of the Peruvian coast which comprises the Pampas of San Jose (Jumana), Socos, El Ingenio and others in the province of Nasca, which is 400 Km. South of Lima, covers an area of approximately 450 km2, of sandy desert as well as the slopes of the contours of the Andes. Hollow Earth Journey supposed to start on June 26, 2007 was cancelled due to a very serious reason.